Justin Hughes for The Drive: Sunday marked the beginning of the 2017 Bridgestone World Solar Challenge, a solar-powered car race across Australia. 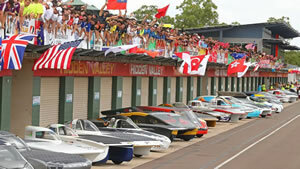 The race begins in Darwin, on the north coast of Australia, and runs 1,880 miles south to Adelaide, on the south coast. This year marks the 30th anniversary of the event. It ran every three years starting in 1987 and every other year since 1999. Needless to say, the technology in these cars has improved significantly over the years. The winner of the 1987 event was the General Motors "Sunraycer," which completed the race at an average speed of 66.9 kilometers per hour (41.5 miles per hour). This was much faster than the second place Ford Australia "Sunchaser," which averaged 44.48 kilometers per hour (27.63 miles per hour), and the Biel College of Engineering entry which averaged 42.93 kilometers per hour (26.67 miles per hour).